This student project requires use of a stereo low power microscope and a flower. 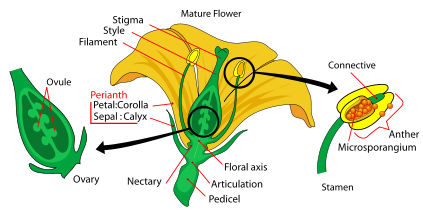 Start by having students take a look at the diagram below in order to learn the parts of the flower. Have each student carefully remove the following parts of the flower as shown above and place them under the stereo microscope. If your microscope has a camera built in, captures images to share with the class. What do you notice about the following parts? Petals (carefully remove the petals from a simple flower leaving the inside stamens exposed). Stamen (remove all the stamens, it consists of a filament (long tube) with a rounded anther (tip). Anther (find the pollen grains on the anther and measure the length of one pollen grain in mm). Ovary (carefully split the ovary in half lengthwise). How many sepals are present on your flower? How many petals are present on your flower? How many pistils are present on your flower? How many stamens are present on your flower? What is the length of the one pollen grain you measured and captured an image of? What is inside the base of the ovary? Prepare a lab report including data, images and any drawings of the flower structure.